This berry cheesecake recipe is the perfect patriotic dessert for Memorial Day and 4th of July with strawberries, blueberries and cream cheese filling. Living where we do in central South Carolina we can get to many great mountain destinations within a few hours but I always love to go the northeast Georgia mountains because one of my very best friends and favorite people on the planet lives there. My college roomy was from the Clayton, Georgia area so I spent a ton of time with her there over the years when we were in school. I fell in love with the area 20+ years ago so it’s my go-to spot for a mountain getaway. The last time we were up for a trip, I got to spend time with Shelly (my old roomy) and her family. Amid all the reminiscing, visiting, site-seeing and long talks, one little pearl stayed with me. Somebody said something about a “cheesecake salad” which was, evidently, a favorite among the family. I learned this was some sort of dessert with a cheesecake filling, strawberries and mini marshmallows. I tucked that away in my gourd for the future because it sounded gooooooood ta meh! 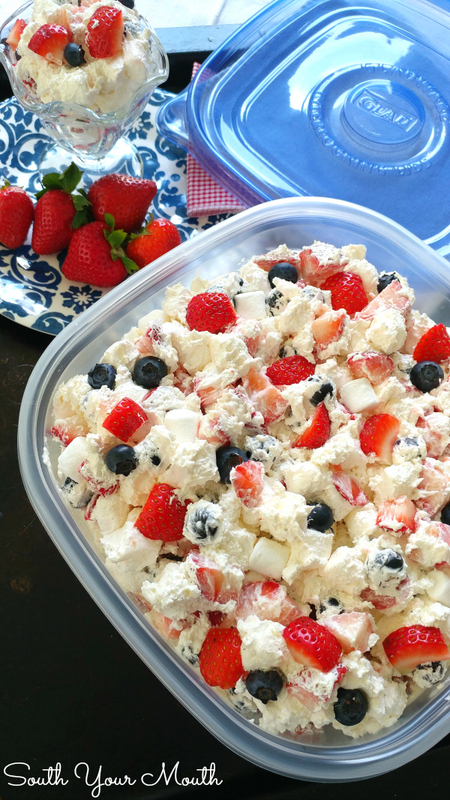 With Memorial Day right around the corner (and 4th of July not too far off) I’ve been thinking of patriotic desserts and decided it was time to figure this whole “cheesecake salad” thing out. 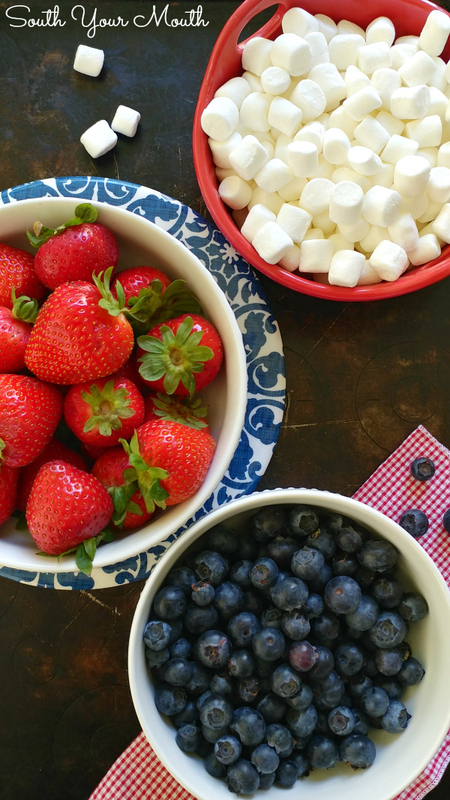 Add some blueberries and boom, you’ve got the perfect red, white and blue dessert! Side note... you could make this recipe work for almost any holiday by using various types of (colors) of fruit! 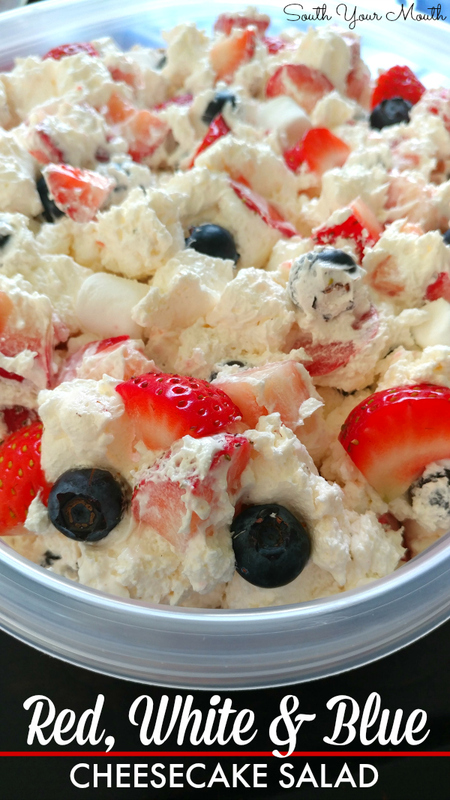 I found a couple recipes for “cheesecake salad” out there but didn’t really love some of the ingredients so I just made it the way that sounded good to me. I whipped up a no-bake cheesecake base then added the berries and marshmallows. I can’t say that I would have thought to use the marshmallows (and was a little on the fence about them) but I knew the recipe my mountain buddies loved so much had them so I used them too. I’m so glad I did because those fluffy little nuggets were the perfect contrast to the rich cheesecake filling and the twang from the berries. When I’m preparing food for cookouts and picnics, I always always ALWAYS reach for my GladWare®. I don’t have to worry about it getting broken or losing a lid and I know everything will stay fresh because they seal up nice and tight! I kind of think of these containers as disposable in that, if I leave it somewhere, I haven’t lost a huge investment but the truth is, I wash and reuse these things over and over and over again. My glass dishes just don’t keep things fresh like the GladWare® does. Remove stems from berries. Cut strawberries into small pieces (similar in size with the mini marshmallows) then set aside. You need to prep your berries before mixing the cheesecake mixture as it will start to set up pretty quickly once mixed. In a very large bowl, beat cream cheese, vanilla, salt and powdered sugar until smooth and creamy. Add half of cool whip then stir until smooth. Fold in remaining cool whip. 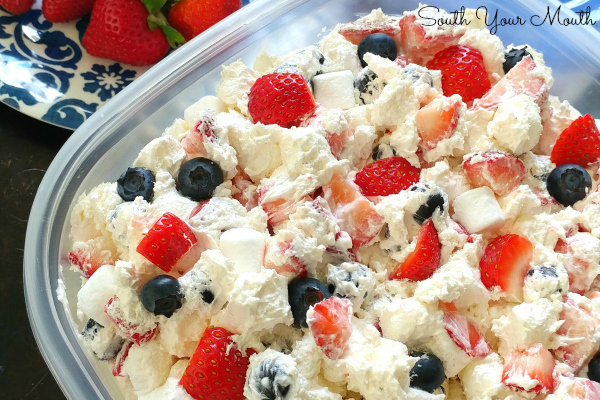 Fold in strawberries, blueberries and mini marshmallows then transfer into a resealable container. 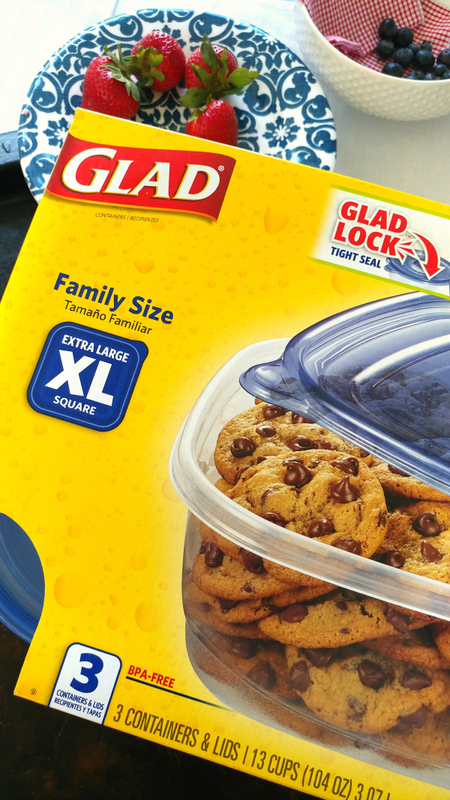 I used the GladWare® Family Size Containers and it fit perfectly! Plus the lid is blue so bonus points on the patriotic color scheme! Holla! I was so excited to read this post, I have alot of family in Clayton & Dillard, it is about an hour 15 minutes from me and Dillard is still the homeplace of our family's "homestead". Can't wait to try this one! I know there are higher mountains and bigger attractions in NC and TN but I've just always loved the small-town feel and laid back atmosphere of the GA mountains :) It's the same reason you'll never see me go to Myrtle Beach. I have zero interest in tourist traps, go-carts, mini golf or outlet malls when I'm at the beach or in the mountains. I want to experience the destination, not the commercial distractions. ps... Edisto and Beaufort SC are my go-to beach and low country destinations! Hey there! 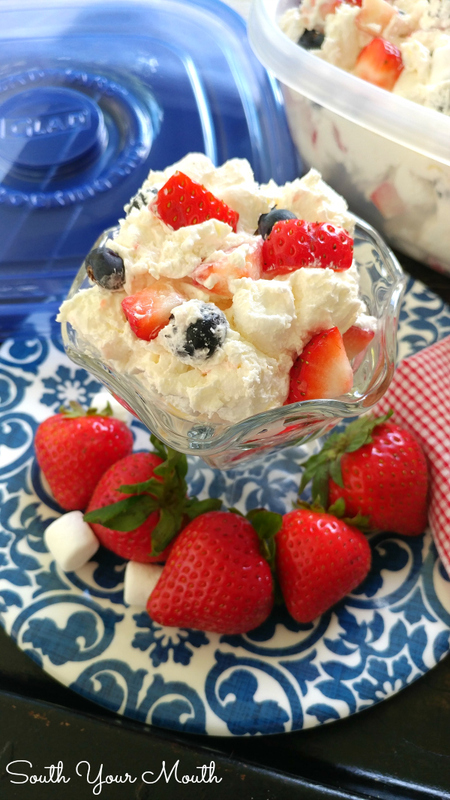 I just wanted to say that this recipe is perfect for memorial day and 4th of July. Love the colors and the mix of ingredients. Thank you for posting it! Could this be made the night before a gathering? Or is it best made the day of? It's best to make the day of because the fruit will start to weep a little a while. I've got my stuff and its definitely on my menu tomorrow! Can't wait to try it out! I made this for the 4th and it was a HIT! My husband is a cheesecake fanatic and he really enjoyed this. Using bananas instead of marshmallows is also delish! Clayton, Georgia is one of my absolute favorite small towns. Years ago I purchased my sweet Beagle (aptly named Georgia) in Clayton, GA. Lovely town with lovely people! This was delicious! I thought it needed some texture though so I'm trying one with a Graham cracker crust.